The event is a brain child of Tina Bawa Ministries Int’l whose primary focus is to bring men and women from diverse culture and denomination to Worship Him In The Evening (WHITE) It is an evening of Yada were miracles happen. Come and be a part of an unforgettable experience in worship . 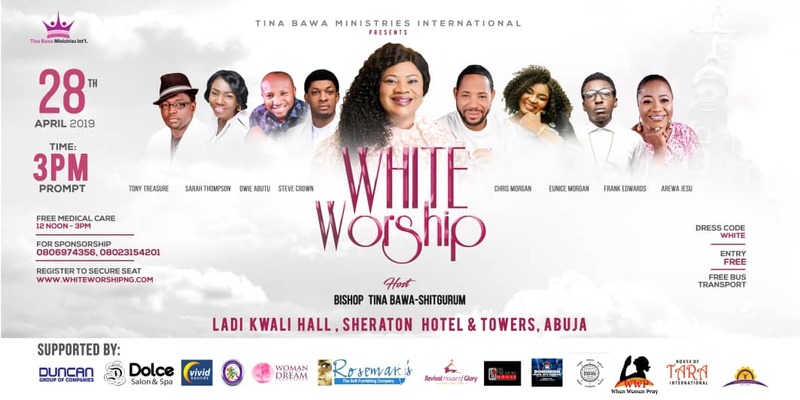 The 2019 edition of White worship will feature an array of great gospel music ministers like: Frank Edwards, Chris Morgan, Steve Crown, Arewa Jesu, Sarah Thompson, Tony Treasure, Eunice Morgan, Owie Abutu, Toluwanimee, Chris Ade, Emmasings and more.